Two men whose pants were sagging low enough to show their boxers were arrested and charged with disorderly conduct after a security guard at a South Carolina Waffle House told them to pull their pants up or leave the restaurant. 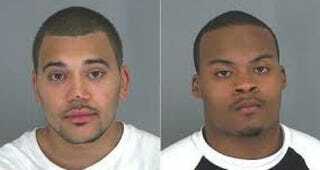 According to the Smoking Gun, Andrew Gehring and Donovan Johnson, both 22, became belligerent and began cursing after the security guard asked the men to leave and they refused. Police were called and according to the Spartanburg County Sheriff's Office report viewed by the Smoking Gun, the two men continued to act out even as the police tried to arrange rides for the young men. "Mr. Johnson and Mr. Gehring both advised that they were out to have fun and implied they were Wofford students graduating this date and it wasn't their concern that proper decorum was needed in the public domain," according to the report, the Smoking Gun notes. The website, made famous for exposing people's arrest records, notes that Wofford College in Spartanburg expelled Gehring after an arrest for grand larceny and burglary in 2011.